Take Kobe New Transit to “Sannomiya.” Transfer to the JR Kobe Line Rapid Service and get off at Tarumi. Go to “Sannomiya” by limousine bus (approx. 65 min). Transfer to the JR Kobe Line Rapid Service and get off at Tarumi. Take JR Kobe Line Special Rapid Service to Kobe. At Kobe, transfer to the Rapid Service and get of at Tarumi. Take the JR Kobe Special Rapid Service to Akashi. At Akashi, transfer to the Rapid Service and get of at Tarumi. It is best to take a taxi from east exit of JR Tarumi Sta. because it’s nearer and cheaper. 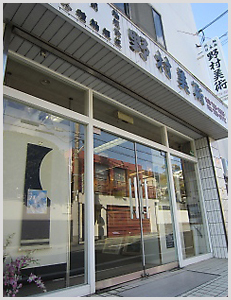 Please tell a taxi driver to go to “Nomura Bijutsu” (bijutsu means art in Japanese). From the Hanshin Expressway Kobe Line going west, take the Daini Shinmei Doro exit. From the Myoudani Interchange, take the immediate left at the “Myoudani Inter Kita” three-way intersection, then turn left at “Myoudani-Cho,” which is the second traffic signal. Go straight the way until you get to the 8th traffic light. Turn right at the light, then you will find ART NOMURA on your left.